Our Herbal Soap is 100% hand made, composed of oils and natural herbs. Made for daily use, it is useful in removing the dead skin via friction between the herbs and the skin. 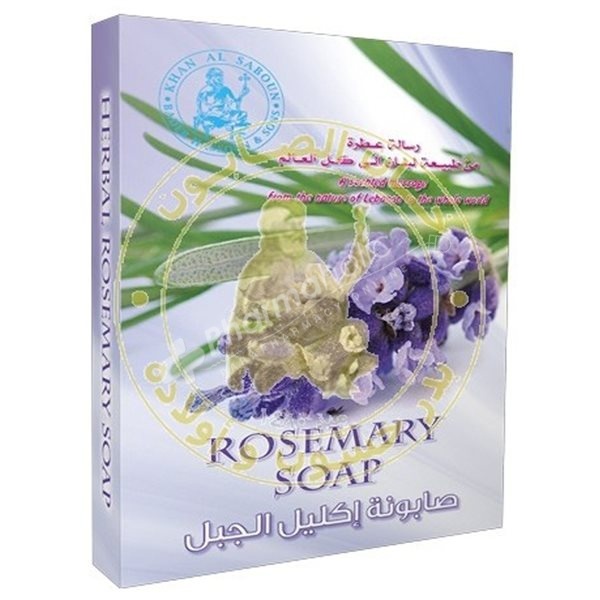 Khan Al Saboun carefully selects the finest herbs and oils in the manufacture of herbal soap. A packet containing six square handmade soaps for daily use. The Pure Rosemarry smell makes it very special and rich with charming scent. It has a great and fresh odor. It is naturally an antibacterial product, and it stimulates blood circulation if used for massage. Pour cool water on your face and body and scrub with the soap for one minute than wash it. Olive oil, coconut oil, rosemary oil, Sodium water, multiple aromatic herbs and oil.